For as long as our country has existed, our military service men and women have made great sacrifices to ensure the safety and prosperity of our nation. Since September 11th, our troops have shown particular courage in the face of great threats. Often, serving in a war has devastating effects on oneself and one’s family – whether it is disruption to education, financial hardship, or severe disabilities born out of courageous acts. 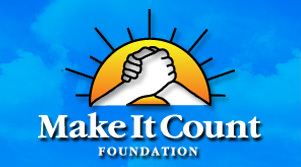 Make It Count believes in honoring our heroes and ensuring that their lives are enriched as a result of their sacrifices. Make It Count is committed to serving these veterans as much as they have served us. Through assistance in a variety of capacities – health, housing, education, and financial relief – Make It Count will support our servicemen and women and their families on their journey back to civilian life.